Open house every Tuesday 5:30-7:30 pm . We specialize in offering affordable venues for all your entertainment needs. My passion is to create a wonderful experience for my clients. All my venues have unique packages that will work with any budget. 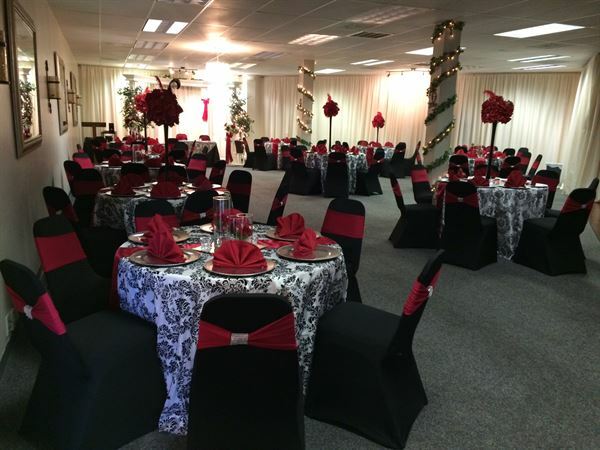 $2,995.00 Limited time special Our deluxe, Elegant Yet Affordable Wedding Reception package includes: Our Hall comes completely decorated for you in your color and design choice From our large in stock selection- we have 22 different colors to choose from!! Tablescapes: all linens – chair covers- diamond back bands – table toppers Centerpieces: several different styles Flowers- crystals –candles - table numbers and more Head Table- all ready for the reception Wedding cake Display- Cake stand- cake server set – toasting glasses- decorative centerpieces Our beautifully decorated buffet area and a centerpiece for your buffet tables- Complete with shirting And all our upscale decorative chaffers and platters too Nice dance area Dance floor with a mirror ball for that extra fun touch. Just right for your first dance! Slideshow screen - Sound system- mic system Our sound system with our relaxing background music mix is perfect for your listening pleasure. Tables Candy table- Gift –Sign in table- whatever you need – all draped- decorated up and ready to go Complimentary cocktail time with wedding punch too! All of this down to the last candle - crystal and table number!